Every day now for this past month, everyone has been sharing their pictures of their Japan trip and whats even better is because it's sakura season now. It's been 2 years since I last been to Japan, the last was during Autumn 2016. I took so many pictures but because of work, I never got a chance to post them. 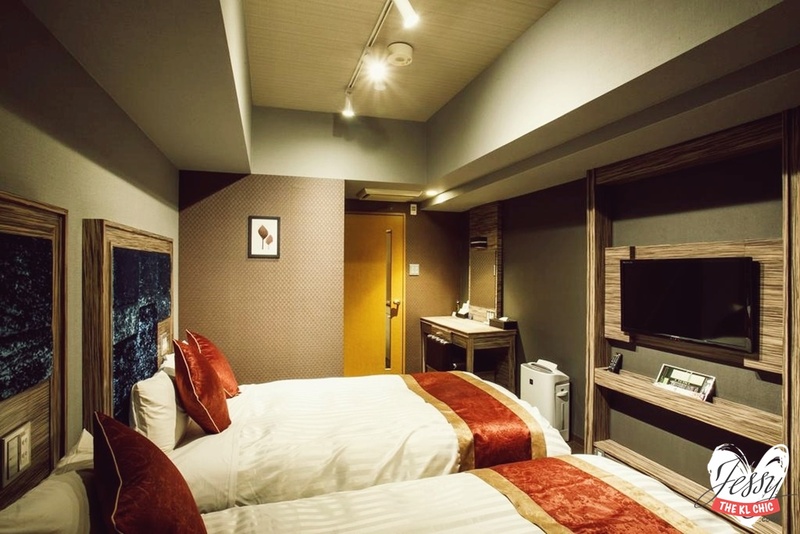 So here you have it, just thought of sharing where I stayed in Namba with you guys. From Namba station, it was about 10-15 minutes walk to Hotel Relief. It's not too far and the building is super visible, you can't miss it. 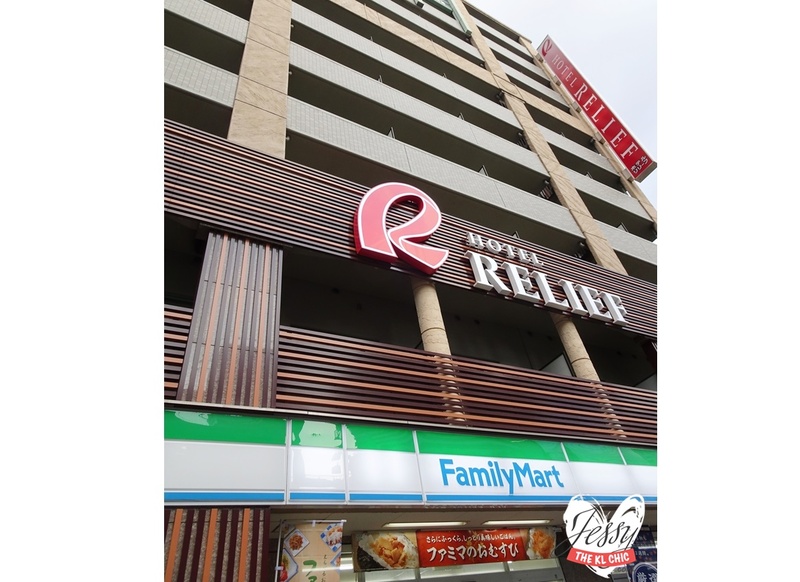 It's above of Family Mart and there would be a huge 'HOTEL RELIEF' sign at the building. My family booked for a Twin Room, Non Smoking with Breakfast for about 3 days 2 nights. For 4 people at Twin Room, Non Smoking with Breakfast is around RM550/per night since I last checked online. So when you reach the building, you would need to take the life to the lobby and you will get a welcome drink while they check you in. When we open our room, first there is a shoe shelf, clothing cabinet, Mini kitchenette, washroom (Toilet bowl and Bathtub/shower was separate) and a bunch of toiletries in a mirror box. There is a door separating the bedding and the rest. In the bedroom, we have 2 twin bed, flat screen tv, dressing table and a heater. The bedroom was tiny! The bed took up most of the space and to walk from on end to another, we had to walk on our beds. We got our room with the view of facing another building. The other building was so close that I felt if I jump, I could reach to the other building. Do remember to bring a universal adapter. Since I'm from Malaysia, my family brought it along with an extension plug. Kiasu right? Haha. To be fair, we needed to charge our phone, camera, internet router and powerbank. Outside of our room was a semi outdoor lounge. It was autumn when I went, so it was nice to just sit outside and enjoy fresh air. It's also a place for those that needs to smoke, they have standing ashtray at the area too. The best part of this hotel was definitely the breakfast. I realise that Japanese people really love western food, corn soup and pancakes. Gosh their pancakes are so fluffy and soft! Eating it everyday was a treat. Seriously so good. Apparently this hotel is famous for their FRENCH PANCAKES, just google the hotel and you will see a lot of pancake pictures. Really love the spread of the food. Was surprise that they had yogurt and fresh fruits like peach and banana. Plus their interior is very homey and fresh. Remember I took these pictures in 2016. So if they had change, remember my disclaimer. I didn't get a chance to go for it as we were always out of the hotel during the day and tired during the night from all of the walking. Plus, I'm shy to try this. Reminds me of my last public bath in Korea. I am still getting nightmares from that. haha. Hope this helps who ever who is looking for a comfortable stay for friends and family. Disclaimer: This is not sponsored and pictures were taken in October 2016. I stayed here for my trip to Kyoto and Nara.